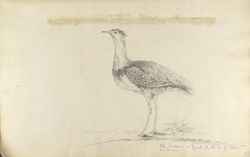 Pencil drawing of the Otis Tarda or Great Bustard of Asia by George Boyd (1800-1850) dated between 1821 and 1844. This is one of 95 drawings (90 folios), chiefly of landscapes and monuments in the Deccan, West India and Afghanistan made during that period. Boyd served in the Bombay Infantry from 1820 to 1850 and was mainly employed in survey work. From 1822 to 1831 he was in the Deccan and Satara; in 1835 he was on survey in Kathiawar; and in 1839 he was making road surveys in Sind. He was mentioned in dispatches during the war in Afghanistan in 1840 and in 1842 he worked on a survey between Quetta and Kalat. The Great Bustard is a large game bird found throughout the arid regions of Africa, Asia, Australia, and Southern Europe. They are possibly the heaviest flying birds in the world; an adult male bird can reach 80 centimetres (two and a half feet) tall with a wingspan of 2.1 metres (7 feet) and can weigh up to 20 kilogrammes, twice as much as an adult swan. Despite this they can run surprisingly fast. The males perform a fantastic mating display in which they inflate special pouches and turn their feathers so that they change from their normal brown colouring to almost totally white.